INDIANAPOLIS -- A turn lane off I-65 on Indianapolis' south side randomly went away, and drivers are wondering what happened. The right turn lane at the bottom of the I-65 off-ramp near Raymond and Shelby streets has been replaced with grass. New curbs have also been installed. Brandon Hager frequently drives in that area, and reached out to RTV6 to find out what happened. "I was like really, really?" Hager said. "Did they just take that out? I just didn't get it." The Indianapolis Department of Public Works said only Citizens Energy Group is permitted to work in the area for a water main relocation. The permit for Citizens Energy is for IndyGo Red Line Rapid Transit. 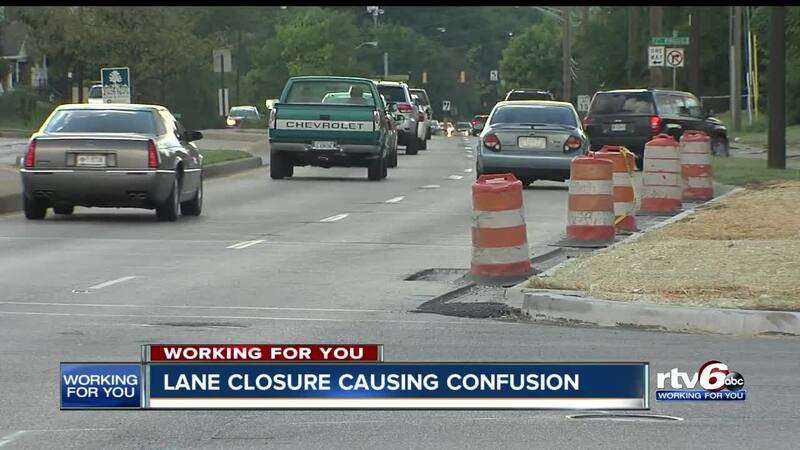 It details a water main relocation and temporary lane restrictions until November. "Without the turn lane, everybody's fighting and battling to get out," Hager said. "Traffic is way more congested it takes longer to get home." A spokesperson for the Red Line project said they went to the Raymond Street location to check it out, but they're not sure who started the project or why. Marcia Hendrix said the intersection has always been hard to manage. The "Right Turn Only" signs are still at the intersection. "It's a lot more difficult because it's making it more narrow," she said. A Citizens Energy spokesperson has not responded to inquiries about the turn lane.